Japan doesn’t need Russian energy as much as its U.S. alliance, but further sanctions would hurt. As my colleague Zach explained at length on Thursday, the Malaysian Airlines Flight MH17 that was shot down within 32 km of the Russian border in Ukraine was most likely the work of pro-Russian Ukrainian separatists. The Ukrainian government has reported that the separatists have the missile capability to shoot down a commercial jet flying at 10,000 meters, thanks to Russia, yet lack the intelligence, surveillance and target acquisition capability (ISR) to readily discern between Ukrainian military and regular civilian aircraft. If that scenario proves to be true and Ukrainian separatists did shoot MH17 down with equipment like the BUK-M1 surface-to-air road mobile missile provided by Russia, this will make relations between Tokyo and Moscow even more difficult. 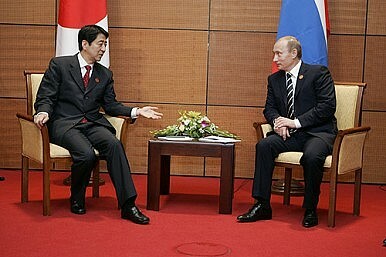 Japan has tried to maintain a dialogue with Russia, ever since the latter intervened in Ukraine and annexed Crimea. This is due to Japan’s increasing reliance on Russian energy imports since its nuclear reactors went offline in 2011, and to negotiations over four disputed Kuril Islands (called the Northern Territories in Japan). However, Japan can certainly not afford to challenge the U.S. and EU stance on Ukraine, particularly if pro-Russian separatists are found to be responsible for the downing of MH17. Yet since its nuclear disaster in 2011, Russia has become Japan’s fourth largest LNG supplier, providing 10 percent of overall imports last year. U.S. President Barack Obama’s latest round of Russian sanctions have targeted state oil firm Rosneft and its natural gas supplier Novatek. These latest sanctions have not targeted Russia’s largest natural gas firm Gazprom yet, but Obama promised further sanctions if Russia did not take clear steps to end the conflict. Aside from energy imports, Japanese companies like Marubeni, JCG and Chiyoda all have major investment plans to increase LNG exports from Russia, with the first two companies are currently planning projects with1 trillion yen ($9.74 billion) in funding each. China has recently moved closer to Russia, signing a $400 billion natural gas deal in late May. Japan would like to counter that deal with some of its own with Russia so that its two largest neighbors do not become too cozy. Russia is also intent on shifting energy exports east as its problems in Europe mount. However, should there prove to be any connection between the MH17 and Russian supplied missiles, further sanctions are almost a certainty. Japan’s delicate balancing act with Russia could be about to become much more complicated, especially with a planned visit from Russian President Vladimir Putin reportedly still being considered. As its energy grid stretches to the limit this summer and with the vast majority of its nuclear reactors offline for the foreseeable future, Japan’s energy supply remains an important strategic concern. Japan's relationship with Russia will remain stalled as long as the Ukraine crisis continues.